Is India really open for business? 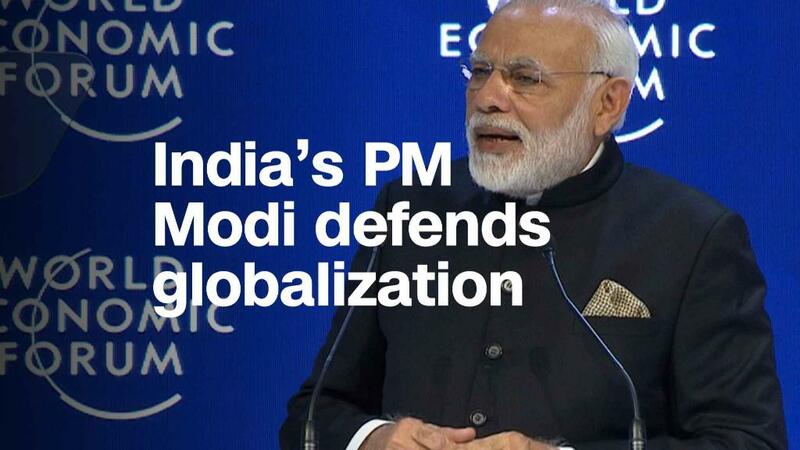 Last month, India's Prime Minister Narendra Modi was warning countries against closing off their economies. "The forces of protectionism are raising their heads against globalization," he said at the World Economic Forum in Davos, criticizing new trade barriers cropping up around the world. Since Modi returned from the Swiss resort town, India has raised some of those barriers itself. The government increased tariffs on imported smartphones to 20% in its budget on February 1, prompting Apple (AAPL) to raise the price of an iPhone X in India to $1,700. More such tariffs could be in the offing. Modi's government is considering a 70% tax on imported solar panels from countries such as China and Malaysia, following a complaint by local manufacturers. That tariff has been put on hold by an Indian court after a solar project developer -- one of many that could suffer if Chinese panels become more expensive -- called it "illegal" and "arbitrary." India's main stock exchanges have gotten in on the protectionist act, announcing this week that they would stop sharing data with international markets such as Singapore in a bid to route more futures trading through India. The moves have triggered concerns that India could scare away investors attracted by its rapid economic growth. Modi encouraged foreign investment during his first four years in office, and it hit a record high in the year to March 2017. But analysts say that could unravel fast. "India's sharp turn toward protectionism will undoubtedly hit foreign investor confidence in the country," Sadanand Dhume, a resident fellow at the American Enterprise Institute in Washington D.C., told CNNMoney. "It raises questions about whether India is still pursuing market-friendly reforms, or would prefer to return to the failed import substitution model of the past," he added. Modi wants foreign investors to help modernize India's economy. But he's also been trying to boost domestic manufacturing and create more Indian jobs with his "Make in India" campaign -- not unlike Trump's "Buy American, Hire American" directive. Trump has slammed India's trade barriers in the past and did so again on Tuesday, criticizing import taxes motorcycle companies like Harley Davidson (HOG) have to pay, while Indian firms export "thousands and thousands of motorcycles" to the U.S. for free. "I don't know why people allowed them to get away with it," Trump said in a meeting on trade at the White House. "I think we should have a reciprocal tax." Harley Davidson has a factory in India and therefore doesn't pay the tariffs. And India exported just 4,000 bikes to the U.S. last year, out of 1.5 million it sold around the world. Related: What is a 'reciprocal tax' and why is Trump talking about it? But Trump isn't the only one slamming India's tariffs. Modi is "on course to erect the wall of protection all over again" after successive governments spent decades opening up India, prominent economist Arvind Panagariya wrote in an op-ed in India's Economic Times newspaper on Monday. Panagariya, who was a senior adviser to the Indian government until August last year, warned that more tariffs are likely on the way. "Unless we work on a direct removal of these hurdles, we would keep hurting our own consumers through higher tariffs without preparing our entrepreneurs to challenge the competitors in the global marketplace," he added.